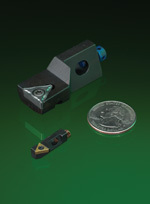 Tool Fab offers an expanding line of cartridges used in indexable tools. Let us know what cartridges you need and we'll make them for you! Tool Fab also designs and manufactures special, custom-engineered cartridges that can be pocketed for any insert required in your machining application. Contact us at sales@toolfab.com or (800) 790-8665 / (414) 453-5030 to talk with us about your needs. You can also go to the RFQ page to submit an RFQ.